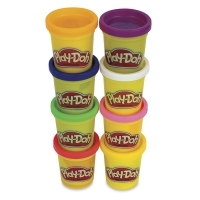 Open a can of imagination with Play-Doh! A soft, pliable modeling compound, Play-Doh inspires curious thinkers and explorers of all ages through hands-on creative fun. Play-Doh's soft, smooth nature makes it ideal for little hands to shape and mold their favorite animals, characters, and themes from nature. Or use Play-Doh tools to roll and cut out colorful shapes such as cars, fish, and spaceships. Play-Doh is great for school and home play, party favors, gift-giving, and more. 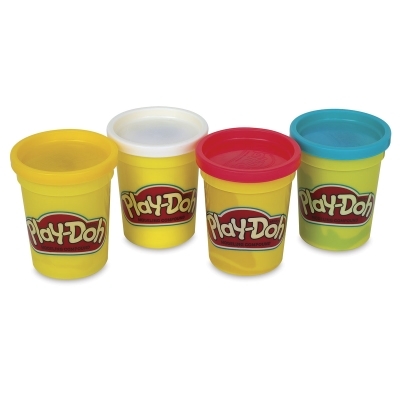 Play-Doh is non-toxic, non-irritating, and non-allergenic except as noted below. It conforms to ASTM D-4236. 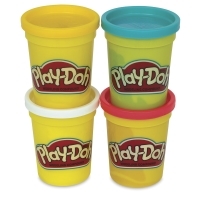 Note — Made primarily from a mixture of water, salt, and flour, Play-Doh contains other proprietary ingredients. 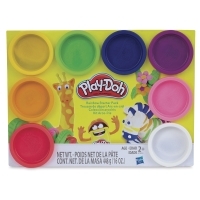 Play-Doh does not contain peanuts, peanut oil, or any milk by-products. It does contain wheat. Children who are allergic to wheat gluten may have an allergic reaction to this product. 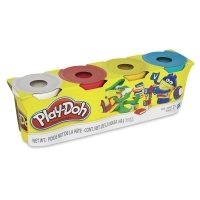 Set of 4 — Flowers, parrots, and all kinds of brightly colored animals come to life using the four colors in the Play-Doh 4-Pack. Perfect for gift-giving and party play, it includes four 4 oz cans (16 oz total). Colors in set may vary. For children age 2+. 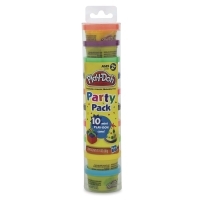 Party Pack Tube — For the best party in town, grab this tube filled with 10, 1 oz mini cans of Play-Doh modeling compound (10 oz total) in a variety of cool colors. They make great party favors! For children age 2+. 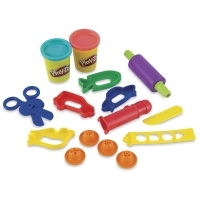 Rainbow Starter Pack — This big pack of Play-Doh holds an endless array of creative possibilities. Little hands can roll, twist, and shape the eight colors into any form that strikes their fancy, then mash them up and start all over again. 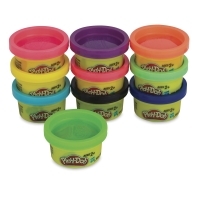 Perfect for play dates and parties, the Rainbow Starter Pack includes eight 2 oz cans (16 oz total) of Play-Doh modeling compound. For children age 3+. Rollers, Cutters & More Playset — This set encourages hands-on fun, as children create cute, colorful shapes such as birds, fish, and cars. The rollers and cutters are great for finishing off their fanciful creations. Mold, shape, mix, and match! 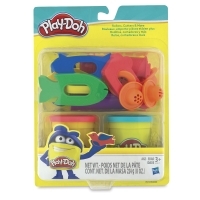 Includes two 4 oz cans (8 oz total) of Play-Doh and tons of accessories. For children age 3+. 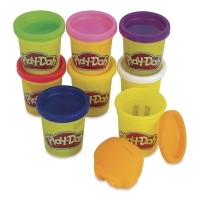 ® Play-Doh is a registered trademark.